ITU Secretary-General Hamadoun Toure (right) co-chairs the Broadband Commission with UNESCO Director-General Irina Bokova. Broadband connectivity has the potential to transform education by giving teachers and students access to learning resources and technologies that will allow them to improve their skills in the context of a globalized economy, according to a United Nations report released today. The report, Technology, Broadband and Education: Advancing the Education for All Agenda, argues that access to high-speed technologies over fixed and mobile platforms can help students acquire the digital skills required to participate in the global economy and contribute to ensure their employability once they finish their studies. “The ability of broadband to improve and enhance education, as well as students’ experience of education, is undisputed,” said the Secretary-General of the International Telecommunication Union (ITU), Hamadoun Touré, adding that online access widens education and employment prospects for students all over the world. According to ITU estimates, the digital divide remains deep despite rapid technological advances. At the end of 2012, there were nearly 2.5 billion people using the Internet. However, only a quarter of these people are located in the developing world. There are also severe disparities in the cost of broadband, which in some 17 countries still represents more than the average person’s monthly salary. 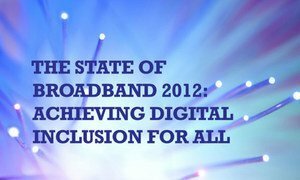 The report, released by the Broadband Commission for Digital Development during the World Summit on the Information Society +10 in Paris, emphasizes the importance of broadband access as a way to accelerate the Millennium Development Goal (MDG) pertaining education, which aims to achieve universal primary education for boys and girls by the year 2015. The report found that in developed countries, about 93 per cent of 15 year olds have access to the Internet at school, with a ratio of eight student per computer. In contrast, only 3 per cent of schools have Internet access in Kenya, and the ratio of computers is one for every 150 schoolchildren in most African countries. The report calls on policymakers to boost efforts that ensure equitable access to information and communication technologies (ICTs) for all their citizens, especially women and girls and marginalized groups. It also encourages governments to provide incentives to support the adoption of ICTs and include digital skills as part of their public education programmes. In addition, the report calls for supporting the creation of online educational applications and services in local content and local languages, which is many times missing from established hardware. Developing countries should also look to establish partnerships with developed countries to close the digital divide. Set up by the ITU and UNESCO in 2010, the Broadband Commission for Digital Development aims to boost the importance of broadband on the international policy agenda and believes that expanding broadband access in every country is key to accelerating progress towards the achieving all MDGs. Some 177 countries have been ranked according to their national broadband policies and the economic impact that Internet access and use are having on their populations in a new United Nations report.